Worst part: The unnecessary bookends. Words like “hipster” and “pretentious” are thrown around far too often nowadays. Intended as insults, these words are too often taken out of context and placed into judgemental analyses. Unfortunately, these words are often directed toward writer/director Wes Anderson (The Royal Tenenbaums, Moonrise Kingdom). Sure, his style stands out from every other big-name filmmaker out there. But why should we criticise him for being different? This year, Anderson has pursued a new and improved form of critical and commercial acclaim. Ralph Fiennes & Tony Revolori. 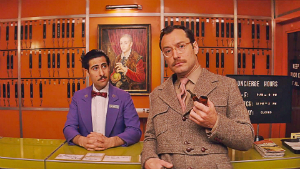 Simultaneously lampooning and embracing his distinctive style, Anderson’s new feature The Grand Budapest Hotel reaches out to newcomers and long-time fans. 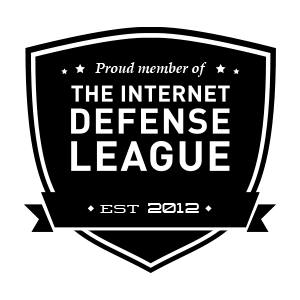 Here, this near-rabid fandom is what Anderson strives for. In this delectable dramedy, his bold visuals, deadpan performances, and relevant themes are dissected and meticulously placed back together. To introduce readers to Anderson’s universe, I’ll describe this labyrinthine plot. In one timeline, a girl places a key on a statue before diving into a novel named ‘The Grand Budapest Hotel’. We are then introduced to the novel’s narratorial force. The author (Tom Wilkinson) describes one significant event in his tumultuous life. From there, we meet the author’s younger self (Jude Law) residing in 1968. Meeting the hotel’s elderly owner Zero Moustafa (F. Murray Abraham), the author enquires about Moustafa’s past. We then examine Moustafa’s younger self (Tony Revolori) whilst learning of the Hotel’s former glory back in 1932. This timeline, set in the fictional Eastern European country of Zubrowka, deals with countries and businesses during wartime. As a lobby boy, Moustafa becomes friends with the hotel’s favourable concierge Monsieur Gustave H. (Ralph Fiennes). Over the years, Gustave courts several rich, elderly women whom come for the hotel’s reputation and stay for his “exceptional service”. 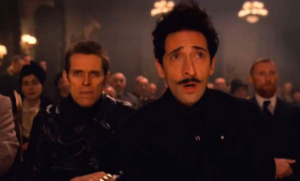 Adrian Brody & Willem Dafoe. Heartbroken over his lover Madame Céline Villeneuve Desgoffe-und-Taxis(Tilda Swinton)’s death, Gustave, after acquiring prized painting ‘Boy With Apple’, is pursued by her son Dmitri Desgoffe-und-Taxis (Adrien Brody), assassin J.G.Jopling (Willem Dafoe), Deputy Vilmos Kovacs (Jeff Goldblum), and Inspector Henckels (Edward Norton). Honestly, it’s difficult fitting this expansive, starry-eyed cast into this synopsis. In true Anderson fashion, commendable lead and character actors fill each role. Here, Anderson’s auteur status ascends to a notch above transcendent. Embracing narrative tropes and visual flourishes, Anderson takes full responsibility for each detail. Conquering screenwriting and directorial duties, this masterful dramedy icon embellishes what others fear. Idealistically, fun concepts are explored in this sprawling tale about hope, love, age, loss, and survival. 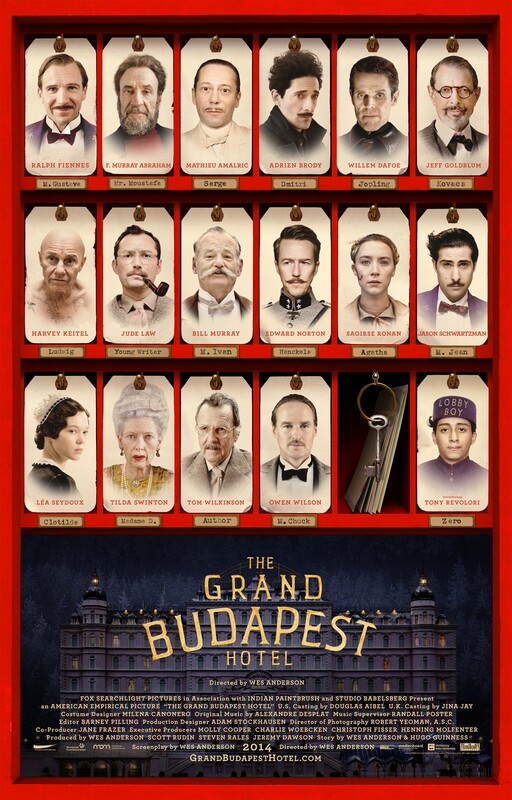 The Grand Budapest Hotel, escaping Anderson’s conventional familial-drama confines, delivers an investigation into an entire country’s peculiar inhabitants. Despite including one-too-many timelines, Anderson’s deft touch and focused direction delivers an honest and fruitful idea of humanity’s lighter and darker shades. The author’s timeline fuses with Moustafa’s in a tricky yet purposeful fashion. As a showcase for renowned performers, The Grand Budapest Hotel is chock-a-block with impactful moments and hearty surprises. In fact, around every corner, characters, laugh-out-loud gags, and clues reside to bolster this quirky tale. In addition, the movie throws gunfights, murders, and tension into this whimsical concoction. Thankfully, the movie never becomes quirky for quirky’s sake. Gustave’s journey never becomes corny or materialistic. Instead, this harsh yet intelligent narrative explores Anderson’s most enigmatic ideas. 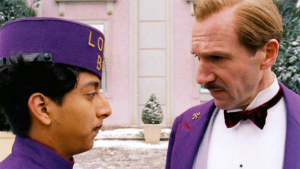 “Keep your hands off my lobby boy!” (M. Gustave (Ralph Fiennes), The Grand Budapest Hotel). Of course, generating fans the world over, Anderson’s signature visual style eclipses this narratorial thrust and opinionated viewpoints. Beyond being the all-knowing creator of prescient dollhouse-like universes, the mis-en-scene, from the ground upward, builds glorious interiors and kitsch exteriors. As Gustave compliments people on their artistic merits, we can see Anderson applauding his own identity and style. Here, his universe becomes more wondrous, idiosyncratic, and gargantuan than anything a modern blockbuster can, and would, deliver. As blockbusters for the indie crowd, Anderson’s features exclaim more than expected each time. Overcoming obvious and ill-conceived preconceptions, his attention to detail almost becomes a cure for a conquering bout of Hollywood-itis. Overcoming the cynicism, his near-symmetrical compositions, clashing colours, stylistic experiments, and blank-faced characters develop near-wordless conversations. Here, his glorious style interacts with over-arching messages. Paying homage to everyone from Ernst Lubitsch to The Marx Brothers, Anderson uses hallways, elevators, cramped spaces, and lobbies to accentuate the story’s manic energy. Fitting its entire cast onto a bevy of key hangars, the poster reveals only a fraction of the movie’s content. Despite the vagueness, these performers, whether they be new to or accustomed to Anderson’s flourishes, admirably reinforce this tale’s enthusiasm, vision, and ideology. Fiennes breaks from tradition to embody this unhinged and comedically-charged role. Tapping into his slapstick chops, the iconic British actor jumps into each scene with charm, maliciousness, and reverence. Newcomer Revolori is also a standout as Gustave’s naive and witty number-two. Bolstering their already esteemed reputations, supporting players like Norton, Goldblum, Brody, Saoirse Ronan, Bill Murray, and Harvey Keitel stand above this immensely talented ensemble. Eclipsing Anderson’s best efforts, including Rushmore and The Fantastic Mr. Fox, The Grand Budapest Hotel is an effervescent and efficient love letter. In addition, it outright refuses to become a sorrowful apology to Anderson’s detractors or even average filmgoers. Anderson, now reaching critical and commercial acclaim, holds his head up higher than even the most respectful hotel staff member. Ideally, it’s worth making reservations for, and checking-in to, this hysterical and dexterous dramedy. Verdict: Anderson’s most gleeful and nuanced effort yet.